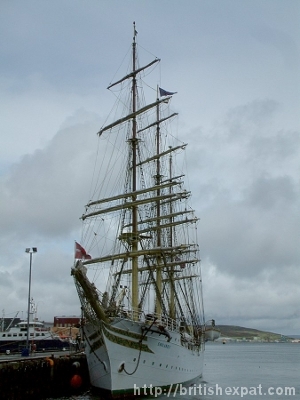 The Norwegian ship Sørlandet – the oldest seagoing full-rigged ship in the world, built in 1927 – in Lerwick harbour in the Shetlands, on its 2011 expedition round the North Sea, the British Isles and Scandinavian waters. This entry was posted	on Wednesday 27 July 2011 at 14:15	and is filed under 2011, Out & About. You can follow any responses to this entry through the RSS 2.0 feed. You can leave a response, or trackback from your own site. Another great picture, and a wonderful ship. Anne, have you tried learning to use an image editor to tune your photos after you’ve taken them? You can achieve a lot just using Picasa, but now that you are becoming such a proficient photographer you should try the Gimp, which is free and as powerful as Photoshop. It even has a decent manual, which it lacked before.